Hello! Just joined the site a few weeks ago...so far this has been the best forum I have run across. I own a 73 Convertible that I am in the process of stripping down (just started early last fall). I have no skills doing body work or welding, so I have to send the old gal out. I hope to get some tips and ideas on this site as I go through my restoration. 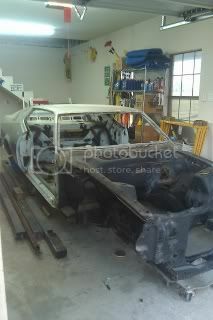 I posted on the maintenance and repair forum to get some ideas on restoring some interior components. I have received some great ideas so far. Thanks for the responses so far! Hope to post agian as I think of other topics. Welcome to the forums! We're glad you joined! Don't be shy...there is plenty of info and help available for the asking! I have no experience either but I bought PaintuCation DVDs and learned alot. I am doing all of my work myself. Give it a try. You will save alot of money. enjoy the site and jump right in and make yourself at home. I am glad to see you decided to post up and introduce yourself. As previously stated, please do not be shy as we have Forums where you can just "shoot the breeze." We pride ourselves on valuing everyone's input and not tolerating "flaming" or any of that other negativity that is often found on some Sites. I am sure you will like it here and I look forward to interacting with you on the Forums. , Joe. One of the unique things about this forum is that beyond infinite, helpful technical details and information, you'll find respect and courtesy, regardless of your question, observation, or stage of your project restoration. A really nice group of folks here. Welcome to the club, Joe! When you get a chance, please post a pic or two. I'd love to see your 73 convertible, and look forward to hearing more about your project. Welcome Joe, We LIKE 73 convertibles around here. This is a good place for en-COURAGE-ment and advice. I consider myself to be fairly knowledgeable and skilled in most areas but the talent on this site amazes me. Enjoy the site and don't be afraid to ask questions and try to do anything we are here to help.